When tooth decay progresses into the nerve chamber of the tooth, the tissue inside (called the pulp) begins to die. 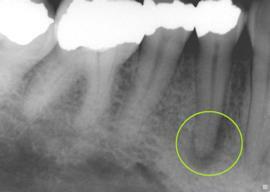 Once the infection gets past a certain point it cant be stopped and the only treatment is to remove the dying nerve tissue from inside the tooth. Through an opening in the tooth, trusted Lemont dentist Dr. Mohajir will clean inside the root to remove the damaged nerve or pulp. This may take more than one appointment, depending on the curvature of the canal. When we’re satisfied it’s free of debris, we fill the tooth with a natural, rubber-like substance and seal the tooth back up. Your tooth is now “non-vital”–without nerves, but still nourished by surrounding tissues. However, because of the lack of tissue inside, all teeth that have undergone root canal treatment are now prone to fracture and need to be covered and restored with a crown. 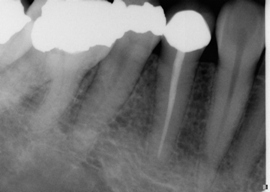 Some patients fear the pain of root canal therapy and opt for extracting the tooth instead. The truth is that the during the actual therapy the patient feels no pain at all, and the relief from the severe pain they had been feeling, prior to the root canal, is almost instant. In fact, during root canal treatment you are just as numb as you would be for any other procedure. Call us today to save your teeth and make that appointment.